Katherine S. Henry « James McElroy & Diehl, P.A. Katie received her Bachelors and Masters of Science in Accounting from East Carolina University and worked in public accounting in Charlotte prior to going to law school at the University of North Carolina at Chapel Hill. 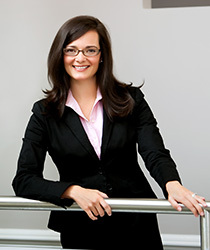 She clerked at James, McElroy & Diehl and joined the firm full-time after graduating from law school. Katie devotes her practice to family law matters, including issues of child custody, child support, spousal support, equitable distribution, and domestic violence.